Last time we covered how we spent the $25,286.50 per person for our travel around the world. In this post, I’ve put together a comparison by country of travel costs that is based on our spend in the country. Our weekly budget bought vastly different quality and quantity depending on which country we were in, so below I’ve assembled a map of the 28 countries we’ve visited by cost. Darker red = more expensive. A cost comparison of the countries we visited, where darker is more expensive. Gray means we didn’t visit that country. Attribution for original map vector in Wikimedia Commons: Lokal_Profil. This cost map doesn’t track exactly with our expenses because there’s a second variable beyond dollars spent: what quality/quantity those dollars bought. 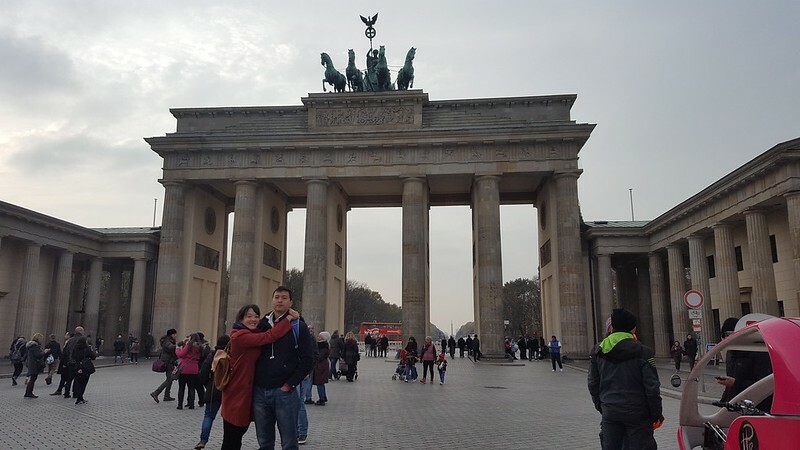 For example, a $15 meal in Mexico was at a sit-down restaurant with tons of food, while a $15 meal in Austria was at the standing-only counter of a local fried-food shack and usually left us hungry. I dub this variable “quality of life” (QoL), with higher numbers meaning better QoL. I then adjusted our spend in each country by dividing the actual dollar spend by the QoL value. So let’s dive into spend by continent and I’ll give you a tip for keeping costs down in each country. The general wisdom here is that the further south you go, the more expensive it gets. This applies to both Central and South America, with Mexico being pretty-darn-cheap (though Mexico is huge, and depends on where you are) down to Costa Rica and Panama, which are the most expensive of the Central American countries. In Colombia travel costs plummet again and slowly rise as you travel south to end up in Chile, where the cost of living easily rivals parts of the central U.S. A notable exception to this dynamic is the Galapagos, where costs skyrocket due to tourism; even with QoL adjustments (we splurged for an amazing cruise), the Galapagos remains the most expensive leg of our journey. Cost comparison of countries in Latin America. Attribution for original map vector in Wikimedia commons: Lokal_profil. If you want beaches, skip Cancun and instead camp at Tulum. The east side is way cheaper than the west side, where tourism has pushed prices up. We saved money on the west side by cooking our own meals, while on the east side we ate out at least once a day. 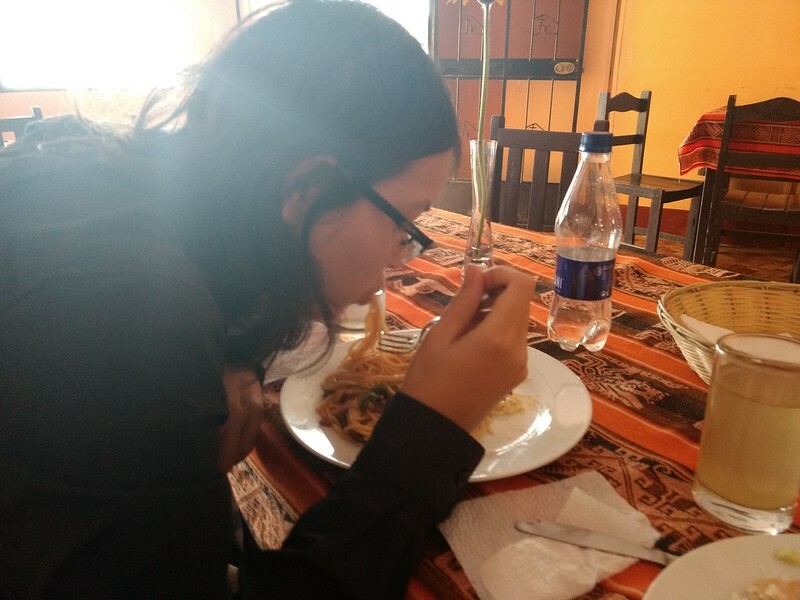 Food can be had for somewhat cheap, but we had trouble finding affordable accommodations online outside of Panama City, meaning you might have to do some searching when you arrive. If you want to watch the Panama Canal in action but the Miraflores Locks museum is closed or out of your price range, take the bus to the Pedro Miguel locks instead and watch the ships pass by for free, though behind a chain link fence. In Cartagena, stay just outside the walled city to get far better hotel rooms and food for less money. Head to Santa Marta or Medellin for a slightly less touristy experience, and in my opinion better food. We found hotel rooms for less than $30 a night in Quito, though food was more expensive than Colombia. Pollo broaster was a staple, served with rice and heaps of beans. If you want a cruise, you can get one for less than list price using the guide I wrote here. Be prepared for even the hostels to be expensive on the island, buy groceries from areas further from the city center, and double check prices before you buy — the price of staples can vary depending on the store (or perhaps whether the vendor thinks they can charge you a higher price than the locals). Low season definitely cheaper in Cusco, the gateway to Machu Picchu, but be prepared for people pushing hard to get money from you. 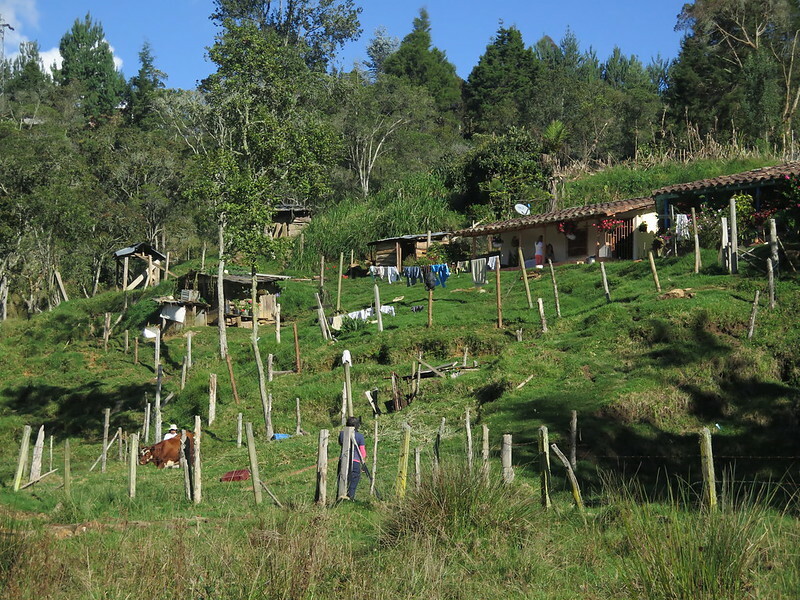 Skip the $200 train to the ruin and instead hike the Salkantay or catch a bus to Hidroelectrica and hike from there. 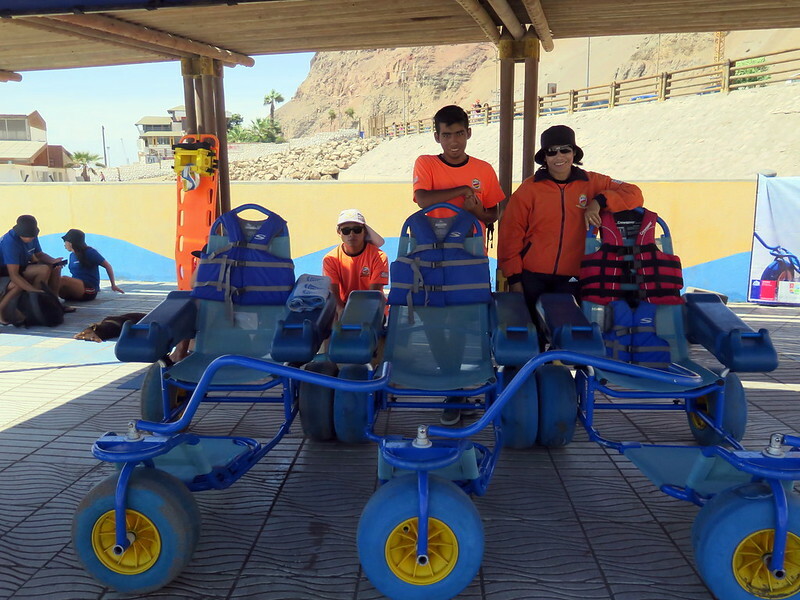 Or if it’s food you’re after, head to Arequipa instead, where food and board will be more generous for the same price. Hostels weren’t much of a thing in Arica, the city in Northern Chile we visited, so be prepared outside of Santiago to do some on-the-ground research for a cheap place to stay. While flights are the fastest way to travel the length of the country, buses are far cheaper and can be taken overnight. These three are stuck together because I honestly couldn’t figure out how to split Russia in half using Inkscape, and the map looked idiotic with Russia just missing. Anyway, the breakdown of cost here is one most people already know: Australia, New Zealand, and Japan are expensive. Hong Kong, surprisingly, has a similar cost compared to Western Europe, while Southeast Asia is super cheap (excluding Singapore, which we didn’t visit). In Europe, things get cheaper as you go east through Central and East Europe; this trend continues through Russia as well. Oceasiaope? Cost comparison of this half of the world, with Africa TOTALLY grayed out because we didn’t get there (next time…). Attribution for the original map vector: Lokal_profil. Hostels and motels are super expensive, so AirBnB it in Auckland, then rent a car and have travel double as your place to sleep. New Zealand has a strong camping culture, so 1) don’t trash it because you’ll ruin it for the rest of us and 2) they have tons of freely available campsites, bathrooms, and rest stops you can access. They’re handily plotted for you in the CamperMate app. While there are free campsites around the islands, many are also a hefty $10-20 a night, so be sure to either account for time to travel to a free campsite or money for that nearer one. If a standard rental is too pricey, you could always also consider a relocation rental, where you pay a nominal fee (between $1 and $5, or nothing at all) to drive a rental car to where the company needs it – just be aware there’s usually a time limit for completing the trip. Another expensive country, though the hostels are more affordable here than in New Zealand. If you’re going to be in the city for more than a week, consider renting a room or flat — Australian rents are often charged by the week instead of by the month, so you can find weekly rentals beyond Airbnb. We visited the island of Java and found it to be one of the most affordable countries on our trip. Save money by choosing hostels in less affluent parts of town (like Glodok in Jakarta); you don’t have to worry too much about crime, save maybe petty theft. Book onsite instead of beforehand online for tours, and check with others for the names and locations of tour and other services because in Vietnam you’ll get six places named the same thing, all of varying quality. If you’re looking for a cheap room in the city, chances are you’re staying in Chung King Mansion. There are dozens, if not a hundred hotels running out of that building, which at ~4,000 people is city unto itself. Be prepared for some closed-spaces jostling and vendor-shouting (“Want to buy a sim card, friend?”, “Copy watch for you? Maybe copy handbag?” – he means counterfeit), complete with weird smells and dirty dishes being carted in soapy buckets in the elevator (there are several illegally-run restaurants in rooms throughout the building). Take it all with a smile; despite the close quarters, violent altercations seem rare. You could also get some of the cheapest food in Chung King, but with tons of amazing restaurants (and some of the most affordable Michelin-starred restaurants in the world), you might want to splurge on food here. Hostels here were surprisingly expensive and poorly-built, but read reviews to find suitable locations and be prepared for a private room to literally be a mattress on the floor with a bare bulb as a lamp. Get cheap food at corner cafe-style, no frills restaurants during the day and in the nightly street markets at night. And yes, you can get cheap sushi here, but sometimes it will make you sick. Oh, and want another way to save money? Don’t get bubble milk tea every day, but good luck with that. You can find affordable hostels in large cities such as Tokyo and Kyoto, but in smaller cities you’re better off going with business hotels, which offer discounts on the weekends (because businessmen have all gone home), or love hotels (which are exactly what you think they are). If you’re watchful, you might also be able to snag a weeknight deal at a ryokan, which will still be a pricey but worthwhile splurge. Cheap food can also be hard to come by, but your best bet are the Gyu-don and Ten-don counter shops you’ll find scattered about the city, especially concentrated around major train and subway stations. If you can’t find one, though, you can always head to 7-11 or another convenience store, where the cheap food offered is freakishly good. 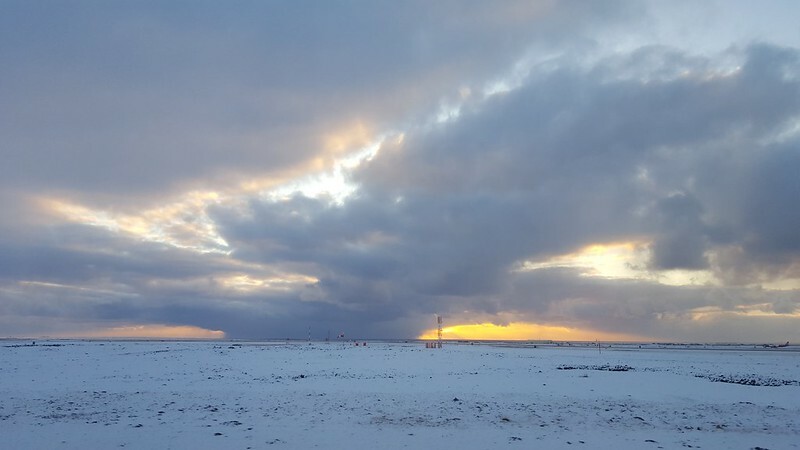 If you want to save money overall, skip Moscow and St. Petersburg and stay east of the Urals, where there is gorgeous hiking, cheap campsites, cheap hostels, and cheap food. If you’re traveling short on money and a light sleeper (or the idea of plazkart terrifies you), go for kupe, where you’ll have other roommates who were also willing to pay more not to deal with plazkart. I haven’t really got good advice for you here, now that we’re in Europe, because save for Bulgaria it felt like we were literally sprinting across the region. 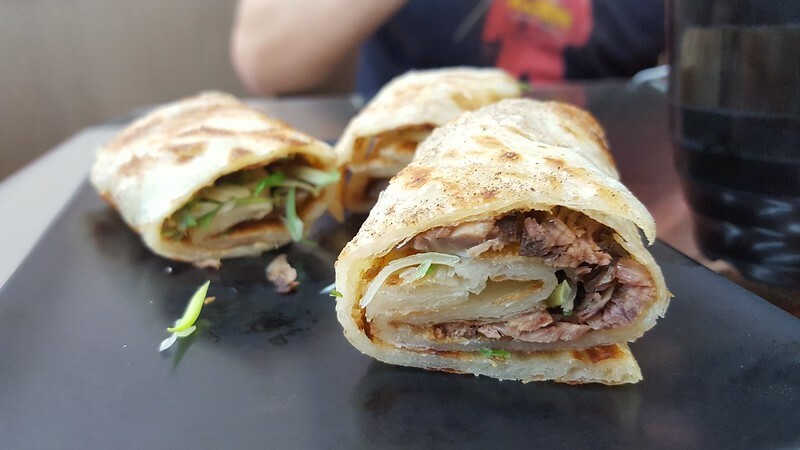 Our biggest tip is to find a place to stay with a kitchen (hostel or Airbnb) and make your own food, because even the cheap eats are pretty pricey (yeah, even that shawarma). If you’re ever in a town without affordable accommodation and you’re desperate, you can always see if the local convent will take boarders for a nominal fee (that’s where we stayed in Sant Agata del Feltria), though in some places morning mass is requisite. 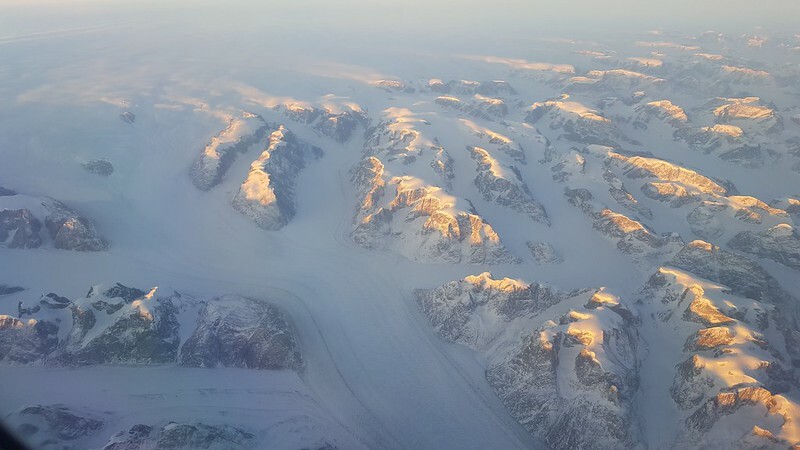 Last time, we talked about the budget process for a year around the world, where I estimated that it would take $28,000 per person (around $500 per week) to circumnavigate the globe (at an enjoyable pace) in roughly a year. After the 54 weeks of travel across 5 continents and 28 countries (31 with layovers), we had spent $25,286.50 per person ($468.27 per week)! Below, I’ll talk about what we actually spent our money on and how we kept our costs down, as well as how you might be able to spend a year traveling on even less. 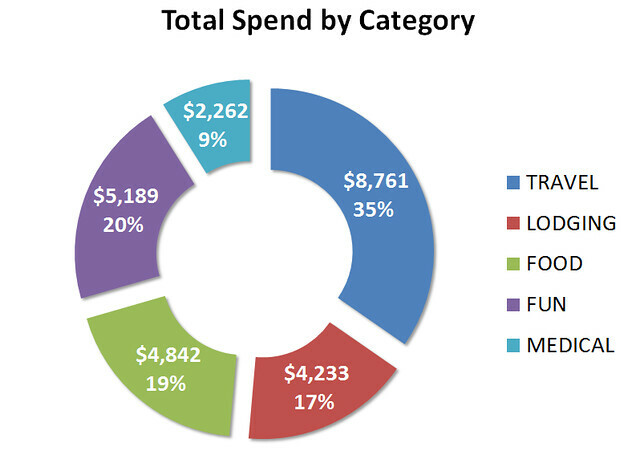 Our breakdown of spend for the year. A budget only works if you stick to it, so I built a tool to help us track our spending through the entire trip. It’s an Excel spreadsheet with tabs that I tracked all of our spend on in five categories – lodging, food, travel, personal hygiene and health, and fun. It then calculates total spend by category for each week and by country. You can download it for free below to use on your trips, and if you have any questions feel free to contact me! P.S., one thing I would change about my budget is to write the spend in on the day the event occurred, not when we purchased tickets. This is the same day for most things, but for travel will help you sort spend better by region. 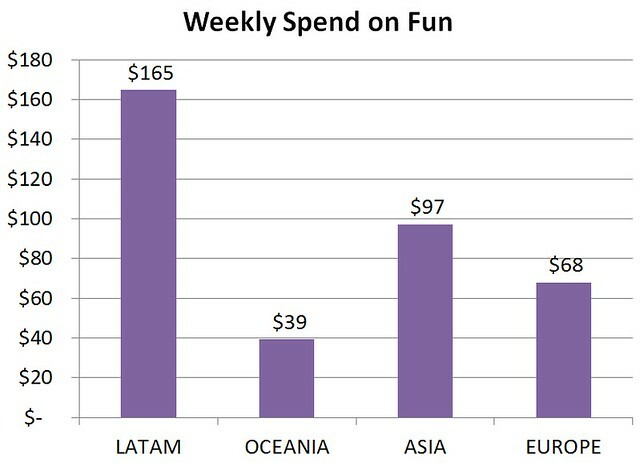 For example, spend in LATAM looked way higher originally because it included the tickets for our flight to New Zealand, but that should actually be part of the Oceania part of the trip. I’ve made adjustments to the data manually below, but it was a pain to do. Because I love data, I ran an analysis on our expenses from the trip and below describe our breakdown of what we expected compared to actual spend by category. 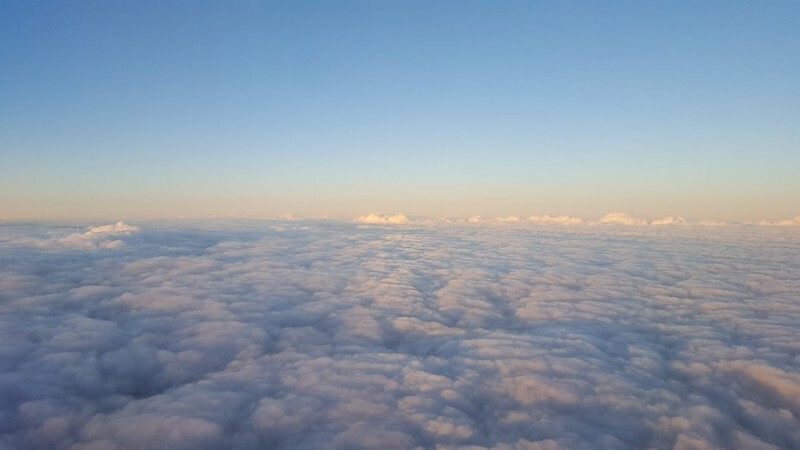 As an overview, travel was definitely the biggest part of our budget, which is unsurprising when you’re circumnavigating the world. But even this, as well as food and lodging cost less than we thought. And as avid hikers and explorers, we found tons to do that was fun and free. 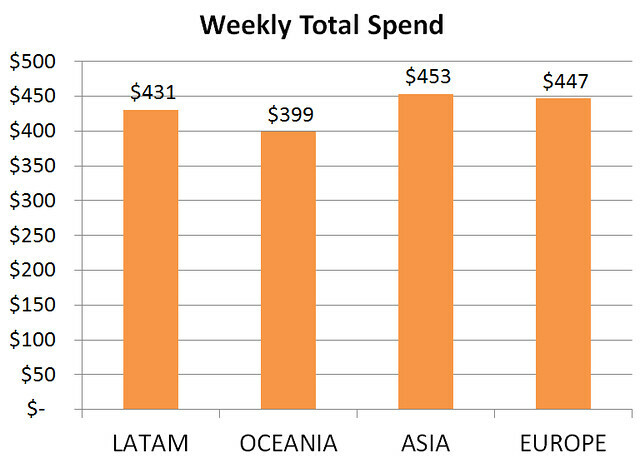 Our weekly total spend by region. As mentioned above, travel was our biggest budget category and is nearly twice the size of our nearest other spend categories (food and lodging). This is primarily because I set out with a goal for us to circumnavigate the world AND chase summer, so we had to travel round the globe in a giant sinusoidal shape (that’s a sideways “S” shape for, for those of you who don’t know). 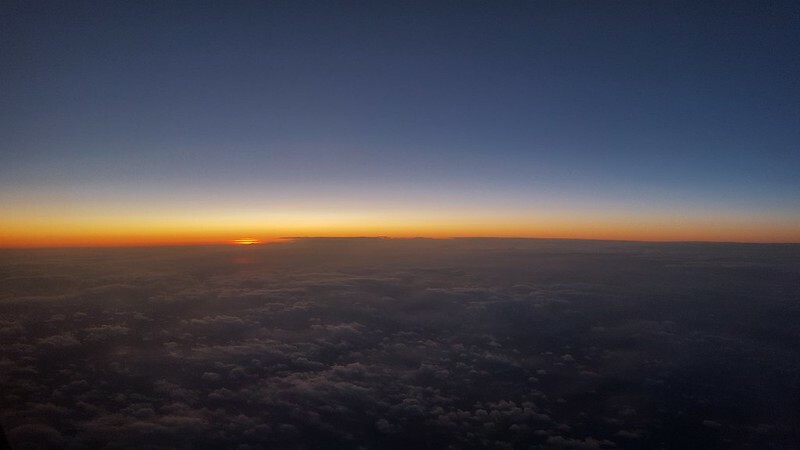 We had to cross both the Pacific and Atlantic Oceans and shift between the Northern and Southern Hemispheres, and that much distance to cover in a year while leaving time to enjoy things means we paid money for flights. 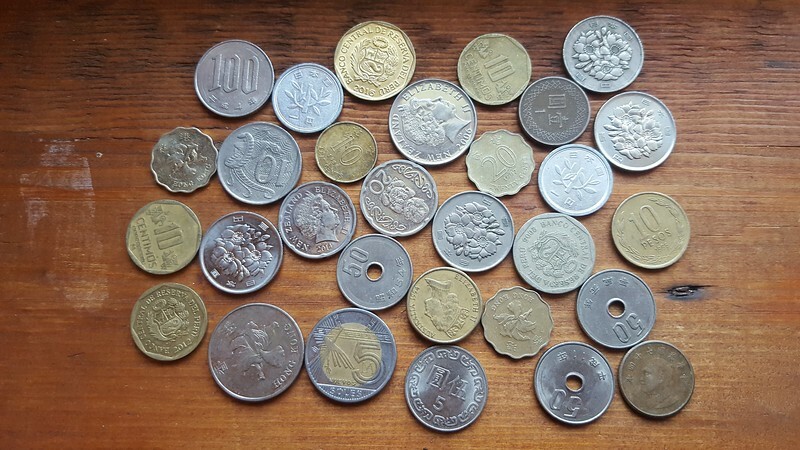 It was normally a couple hundred dollars here or there, but there were also a few big-ticket items like the flight from Phoenix to Mexico City, to and from the Galapagos, from Santiago to Auckland, and the flight home from Berlin. Trains, which were really only available Western Europe as a mode of transit (save for Russia and Indonesia), were surprisingly often as expensive as flights. Bus was often the slowest, but cheapest and most interesting option between locations (even the bus ride from hell counts). 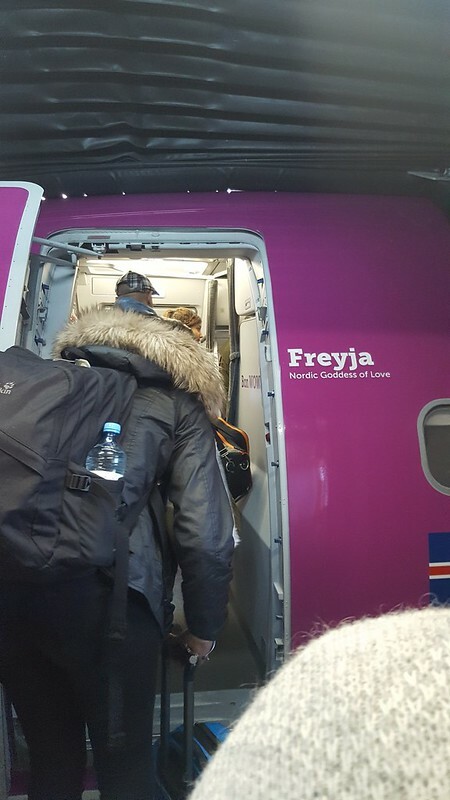 Our best rule for saving money became the two-week rule: unless there was no other way, we booked flights only if we were travelling more than two weeks out. If we were within the two-week period, we caught a bus or some other mode of transit instead. Rome2Rio helped us out a lot in figuring that out. 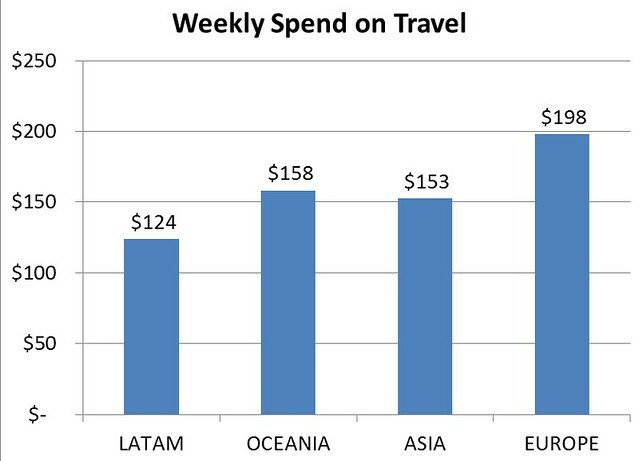 Weekly spend on travel by each region; definitely pricier in Oceania and Europe, while Asia’s is higher because we bought 2-week JR passes in Japan. Another expected, constant cost of our trip was a place to sleep each night. 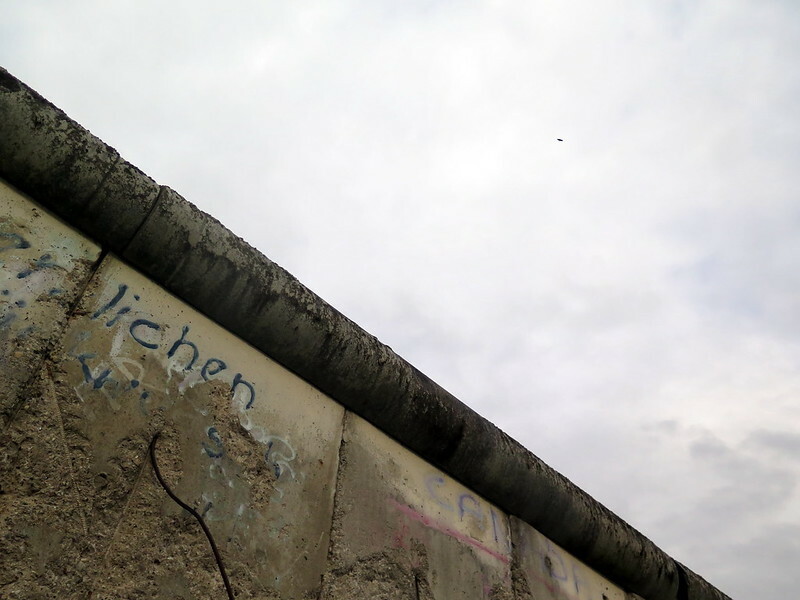 We had a budget of $15 per person per night, and what we could get for that varied a lot both between and within countries — heck, it varied a lot even within the same city. Prime example was Cartagena, where a private hostel bedroom within the walled city with the bed taking up nearly the entire space, no AC, and gaping holes in the ceiling that let mosquitos in cost us as much as an air-conditioned, modern room with a TV just outside the city’s walls. My primary strategy to keep cost down was research, research, research. If I had the time or knew we were going to be somewhere for a while in advance, I checked Hotels.com, Booking.com, and HostelWorld.com for the cheapest deal, looking in particular for multiple-day stay discounts. If it was last minute, I skipped HostelWorld and just stuck with Hotels.com and Booking.com, looking for last-minute discounts. We also cut costs by having transit sometimes double as lodging, taking overnight buses, flights and trains. 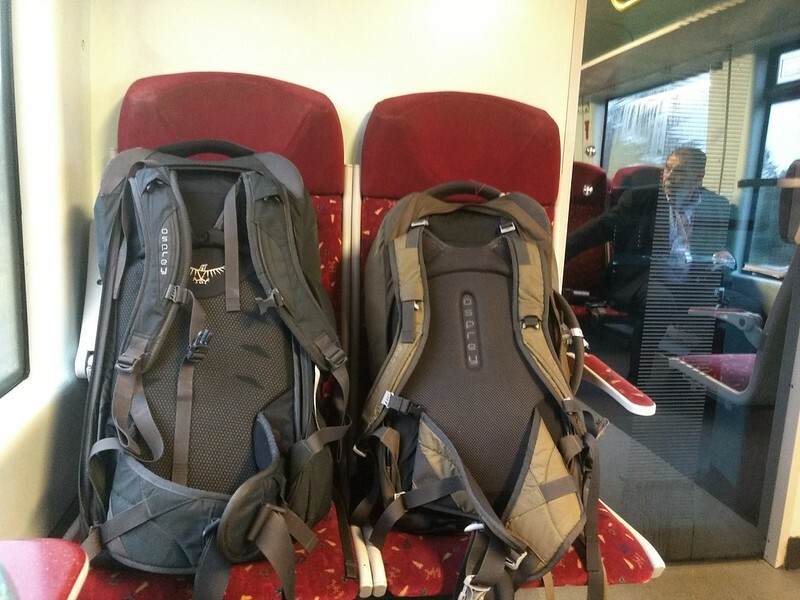 This was particularly helpful in South America, where long-haul buses are commonplace and first-class seats were affordable for travelers, even on our budget. 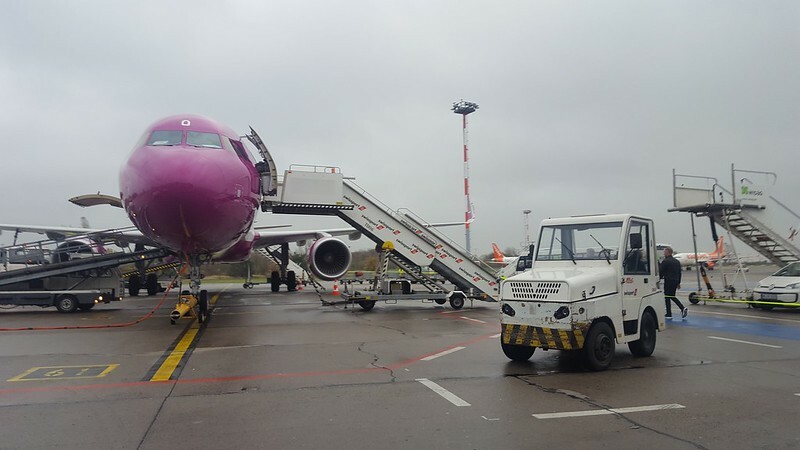 For flights, the airport often doubled as our accommodation, as we would find a quiet part of the airport and rolled out our camping mattresses before or after our flight. Since people frequently sleep overnight in airports (there’s a whole website dedicated to it), most airport staff don’t bat an eye. Lastly, we cut about a month’s worth of lodging (and food) costs and had the most amazing time possible by doing the obvious: visiting where we had friends and family currently living. It meant we had a happy host, a welcoming bed, amazing food, and often a far better guide than the internet to the area. 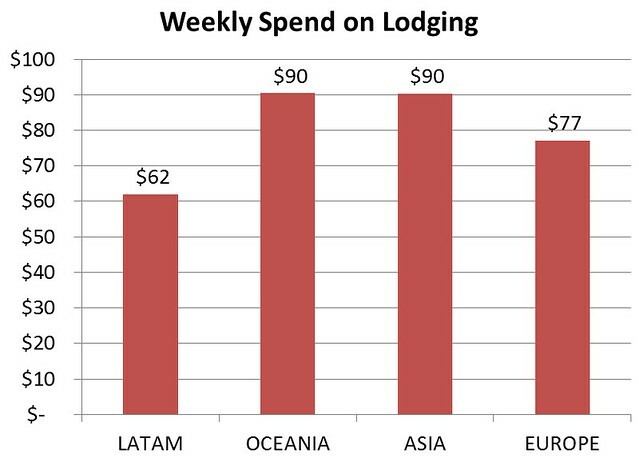 Weekly spend on lodging by region; the spend in Asia is so high primarily because of Japan, but also due to a few nights of splurging on a hotel room here and there, and lower in Europe because of stretches of stays with friends and family. 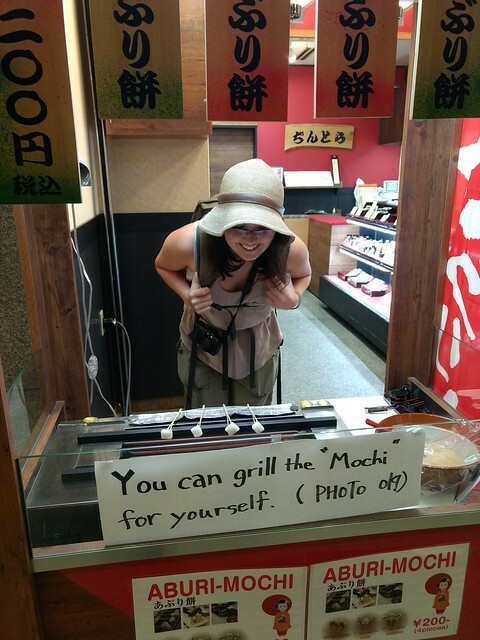 Like having a place to sleep, you always gotta have something to eat, but we found while food could vary wildly by country, we had more control over it than the cost of lodging. If you’re staying in a hostel in almost any country, you can pick up ingredients from a local market and cook a meal for a fraction of the cost of a meal out. This played a big role in making Western Europe affordable, where we saved for one nicer ~$25 meal a day and otherwise snacked on homemade sandwiches and salads. The only caveat I would give here is that there is an opportunity, no, an enjoyability cost. Because a place’s cuisine is often unique and singular to a place (like the culture), it’s worth springing the money to enjoy at least a couple of meals and understand how the locals eat. We would rather spend a little extra on food over lodging any day (which usually gives you less of a window into culture), and our actual spend reflects that. Beyond cooking your own meals, the other way to save costs is the above-mentioned stay-with-friends-and-family method. Not much can beat a home-cooked meal, and in many countries your more rural relatives have better tips on the best cheap places to eat. 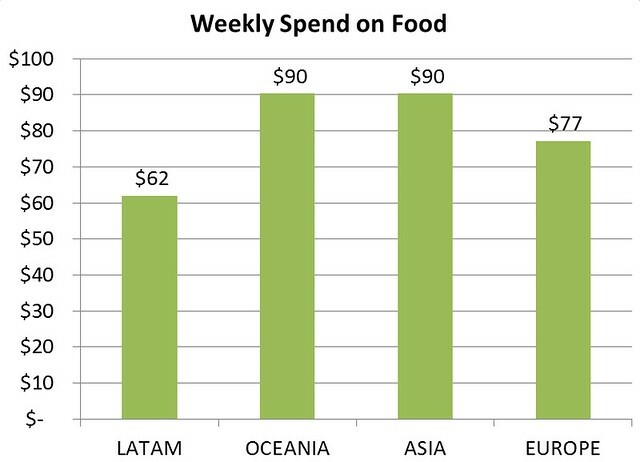 Weekly spend on food by geography; Asia is high primarily due to volume of food and not necessarily cost, and costs in Europe are lower due to a lot of staying with friends and family, netting us delicious meals. So depending on whether you want to count the pre-trip costs in the budget, I was either wildly under-estimating this one or just a little over-estimating it. When I put together the trip budget, I originally dropped the pre-trip expenses into a different spreadsheet and built the travel budget without it, so I wasn’t counting the travel insurance. As I mentioned in the last post, that travel insurance wasn’t useful beyond peace of mind, because even when I took a fall in Peru and needed an X-ray, the full cost of the visit was the equivalent of ~$200 USD and it was difficult to keep track of receipts and submit them for reimbursement while moving around so much. Otherwise, this category sat pretty unused with the exception of repairing our equipment and restocking medicine, which I’d recommend purchasing when you are getting modestly low, not when you’re low or out, because there are some countries that just don’t have certain medicines. 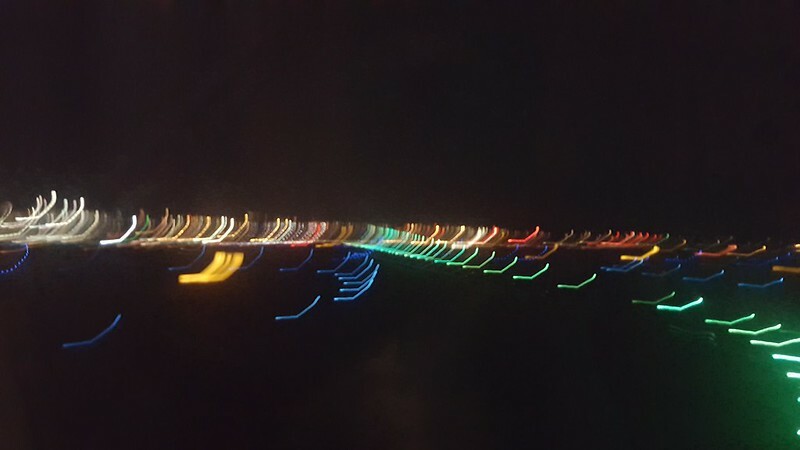 Pharmacists in Indonesia and Vietnam, for example, had no idea what bismuth subsalicylate (Pepto Bismol) was, so we were out until we got to Hong Kong. The equipment repair and replacement was also pretty variable, and mostly consisted of us repairing the same pairs of shoes we wore throughout the trip. In general, a good rule to determine whether you should repair or replace is look at the current socioeconomic status of the country around you; depressingly, it’s affordable to get things repaired when you’re in a poorer country, but to buy something new when you’re in a richer country, just because of the variation in cost of labor. 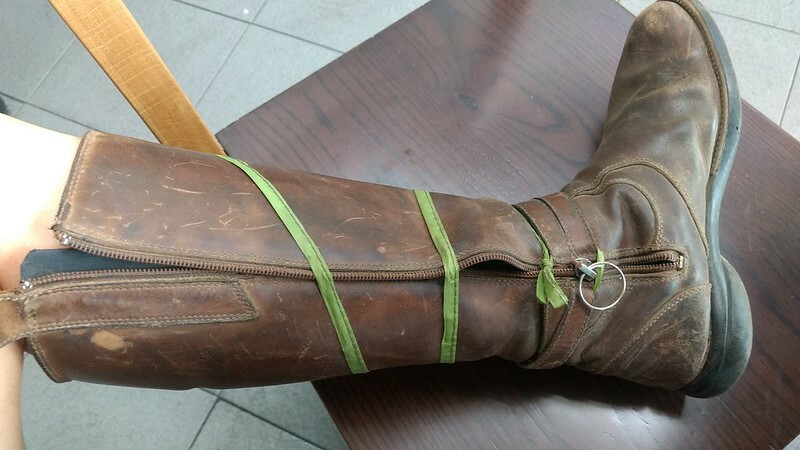 In some countries, we couldn’t even find people who still repaired camping equipment or shoes. 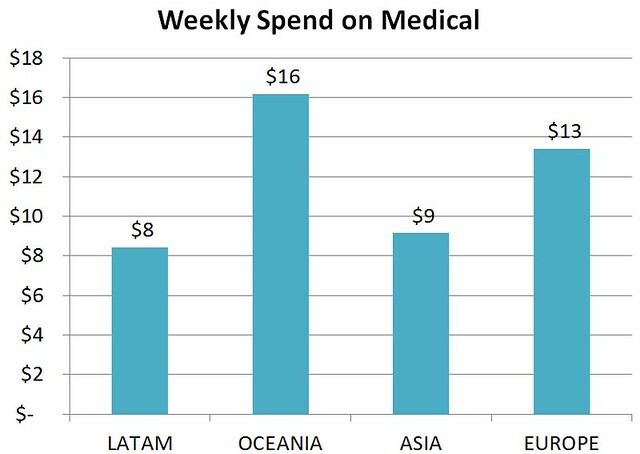 Weekly spend on personal hygiene, medical, and emergency by geography. The cost in Oceania is so high because we bought a UV sterilizer when our water pump broke, and in Europe we had to renew travel insurance. I’m thrilled to see the budget for fun experiences and souvenirs is almost spot-on with what I predicted, because I wasn’t sure if I had dramatically under-or over-estimated. We started out in South America being cheap as hell and got a little spend happy in a couple of other places (Japan, Western Europe, looking at you). We did have a couple of big splurges on the trip, like the five-star Galapagos cruise with a Cordon Bleu-trained chef on board (why our LATAM bar is so tall) and fine pens/hobby equipment in Japan. I also placed meals in really nice restaurants in this category because they felt more like experiences than food. But overall, we managed to keep costs down by being outdoorsy people and going for hikes or walking around town. We would also ask locals for recommendations on what to do for fun, as these tended to be way cheaper and more interesting than whatever was set up for tourists. 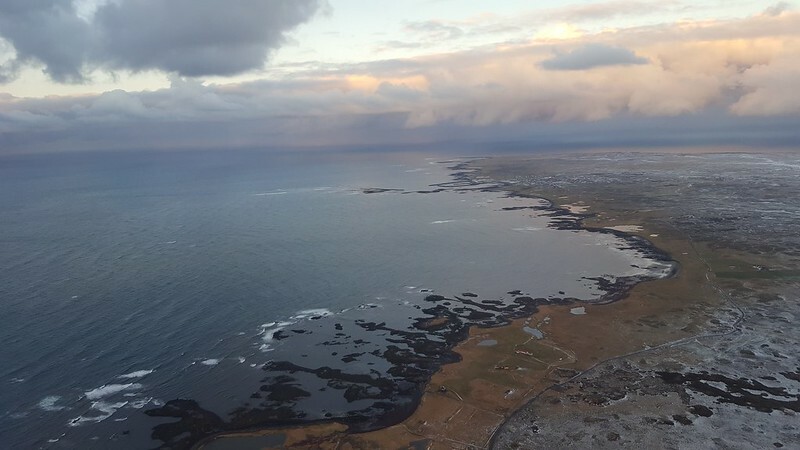 Weekly spend on fun experiences and mementos by geography; the cost in LATAM is our $3,000 Galapagos cruise, and everything in Oceania cost so much money to do that we basically on did free hikes. There are two ways you could travel for a year on less: make fewer hops between countries, and stick with cheaper countries. We stayed in a location 1-2 weeks before moving on, which meant we were paying a lot in travel expenses. We also intentionally visited some more expensive countries (New Zealand, Japan, France, Germany), because we wanted to see them. If you weren’t set on the idea of circumnavigating the planet, stick with just Asia or LATAM and save yourself the cost of cross-continental hops. Next, I’ll be doing a breakdown by country of our costs and provide some tips on how to save money in each country. 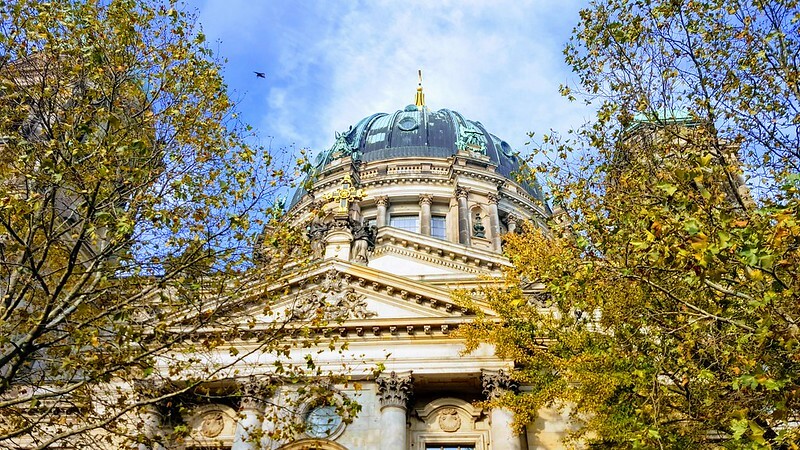 Read Part 1: The Budget. Read Part 3: Country Comparison. My boyfriend Stoytcho and I traveled around the world, across 5 continents and 28 countries (not counting layovers) for 380 days. “Wow, amazing! How did you plan it?” people say. Or, those more to the pointed among you ask, “How much did that cost?” The short answer to you is: not as much as I thought it would. 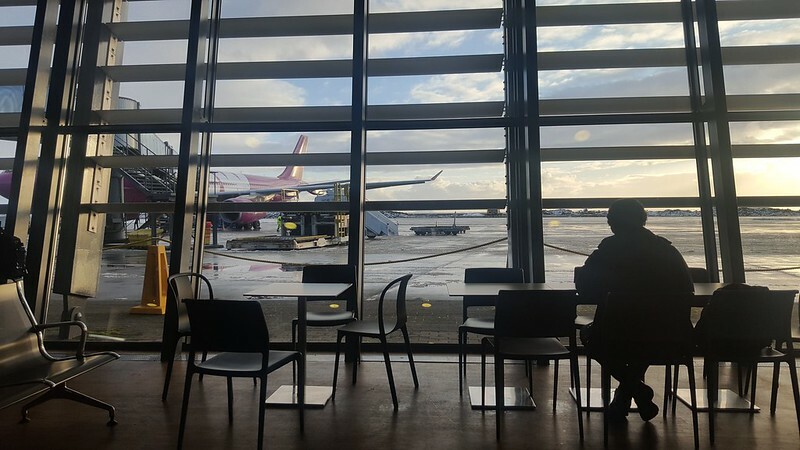 Budgeting a year of travel around the world is a big project, but when planning something like this the goal is to get a rough estimate of the cost and wherever possible, take the higher cost. It’s better to over-budget than to under-budget. In my case, I used the benchmark of living in the U.S. for a year, which was around $30,000. The U.S. has an advantage of being one of the most expensive countries in the world to live in, so it had a built in overbudgeting factor. Then again, we would be spending money on planes and trains and general transit that I wouldn’t normally in a year, so I left that $30 K number where it was. I then separate out the individual things we would need to budget for: food, lodging, travel, fun (experiences, souvenirs), and miscellaneous (which ended up being mostly medical and personal hygiene expenses). Partly based on personal experiences in prior travel, partly based on internet research, and partly because I watched a ton of Rachel Ray’s $30 a Day travel food show as a kid and thought “holy crap, $30 buys you a ridiculous amount of nice food”, I set the food budget to $15 a day per person. I did the same for lodging, mostly based on prior experience traveling in Australia, figuring that was the more expensive end for hostel beds. This made $105 per week per person for each of these categories. An affordable lunch in Taipei. For the travel budget, I priced out the cost of our most expensive trips (these were big flights/trips like the one from Chile to New Zealand and the Trans-Siberian trip from Ulan-Ude to Moscow), then guessed at the number smaller hops we would have to make and their average cost to get ~$200 per person per week. Train, bus, and plane were our main modes of transit, like this train in Germany. Personal hygiene and medical costs I totally just fudged – maybe $20 a week? That’s enough to buy over the counter anti-diarrheal and cold medication here in the U.S., as well as personal hygiene products (sunblock, toothbrushes, deodorant, etc.). That also leaves enough for any potential rare but costly medical expense (I got $200 X-rays in Peru after a fall). While we had a year of travel insurance that cost an insane $1,700 per person, we never used it once because it turns out submitting reimbursement forms while traveling is really hard. (Who knows how to say “fax machine” in Bahasa Indonesia? Oh, and where did those receipts go again?) It was good peace of mind, though, so get it if you want that. Another thing it note is that this is where a lot of our pre-trip costs ended up, including the aforementioned travel insurance and all of our travel vaccinations, which included but were not limited to: Yellow Fever, Japanese Encephalitis Virus, Influenza, and Hepatitis B. This is also the bucket where I tossed the cost of 3 weeks of malarone, our fairly pricey anti-malarial. Actually, a lot of this category ended up going to patching any equipment as it fell apart, or buying new equipment. 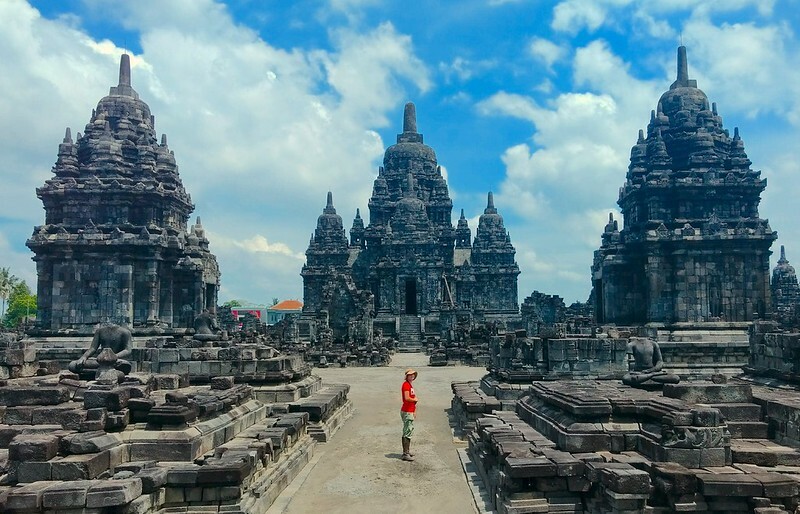 Prambanan on Java, Indonesia, a pretty affordable travel experience. There was also this category of “communication” that I had intended to account for SIM cards abroad and estimated at $20 per person per week, but then it turns out Stoytcho’s T-Mobile plan worked EVERYWHERE we went except for Vietnam, where a 2-week 4G-included SIM cost about $15. So just save yourself the trouble and get on T-Mobile’s phone plan to scrap this category for yourself. The legendary phone that (almost) always had data connection! It also doubles as a size reference. With these 6 categories, our total spend came out to a neat $500 per person per week, meaning a total of $28,000 per person for the 56 weeks (a year and some change, just to be safe). After traveling for 54 weeks through 28 countries (31 if you count layovers), we had total spend of…$25,286.50, or $468.27 per person per week! How’s that for some on-spot budgeting? Tune in next time to find out how we traveled around the world on less than it takes to live in the U.S. for a year*! *Ok, living costs in the U.S. vary pretty significantly, but I’d argue this is true of the average cost of living in the U.S. It’s probably less than what you’re spending right now, and you could live abroad for far cheaper than we did. I’ll detail how in the next post. Read on to Part 2: The Spend. One: People are generally good. 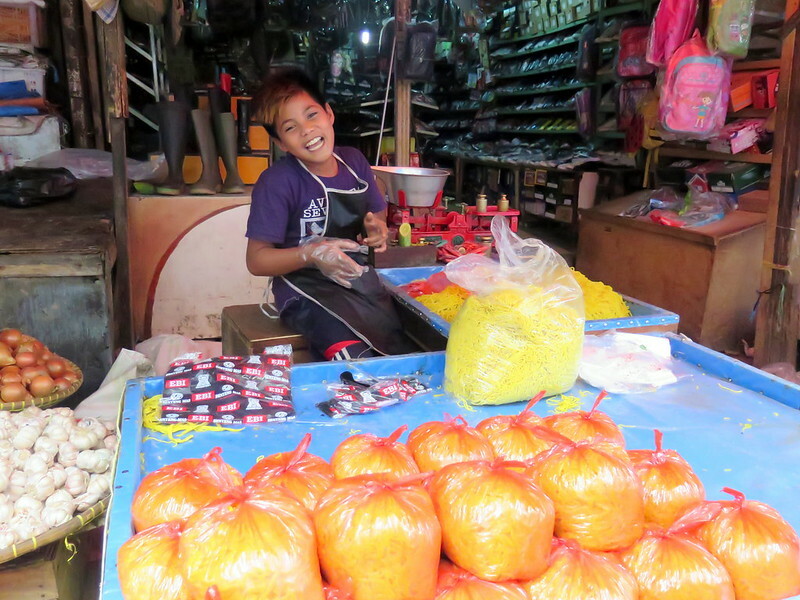 A kid poses while working a market stall in Jakarta. It’s easy to be cynical about people in the world, now moreso than ever, so it’s easy to dismiss this first one as some bland attempt at higher moral values. But the goodness of people and their willingness to help when you need it is one of the most humbling and powerful parts about real travel. From the guys who picked us up as hitch-hikers stranded in central Java and refused to accept what little money we had to our cabin-mates who generously shared their food with us on the trans-Siberian rail between Ulan-Ude and Krasnoyarsk, people were incredibly kind to us when we needed help. These fine folks watched our stuff while we went swimming on a beach in Chile. And it wasn’t that they felt we were in a position worse than theirs — as foreigners travelling, we are clearly well off and could repay them. 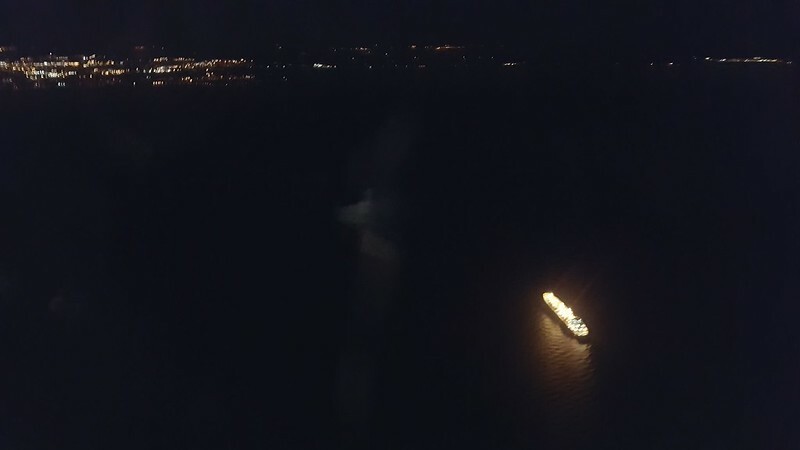 We could have easily repaid the women in Goryachinsk who took us into their dacha for the night, or the man in Panama who paid for my bus fare when I miscalculated how much it would cost to fly to the airport and this was the last bus we could catch to be on time for our flight. They could tell we could repay, but that wasn’t the goal. Kindness was. 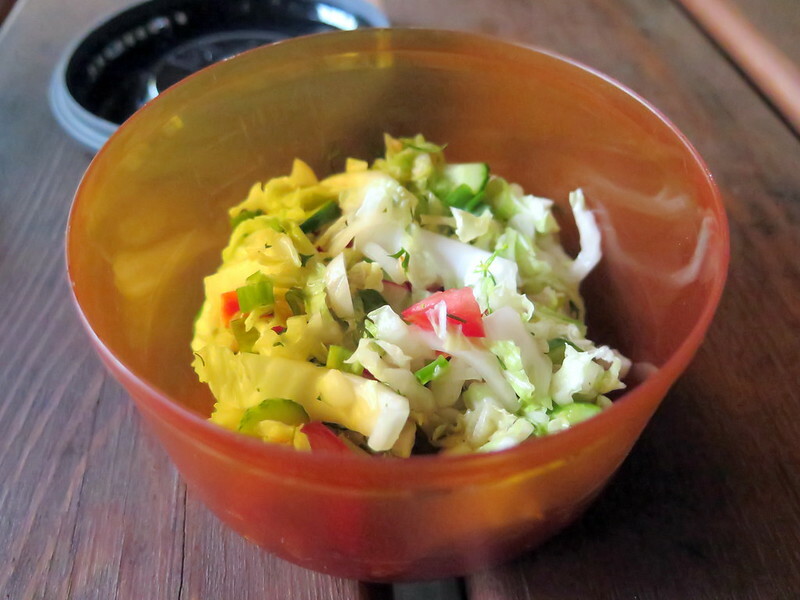 A Russian couple we met while camping in Stolby insisted on sharing their food with us, including making fresh salad each night. That being said, those who are most eager to help you often don’t have your best interests in mind. These are often people looking to ingratiate themselves to you and then harness reciprocity to get something from you in return. A great example were the luggage carriers in Probolinggo, Indonesia: guys who would hang out where the jeeps dropped off tourists and eagerly offered to help carry luggage. They not only expect a tip, but are often in cahoots with men who sell fake tickets at the bus station and will direct you to purchase tickets from them, expecting that their first favor to you will blind you to what’s going on. In these situations, I often got a “weird” feeling that was difficult to ignore, and it was worthwhile to listen to it. Two: Water is a problem everywhere. 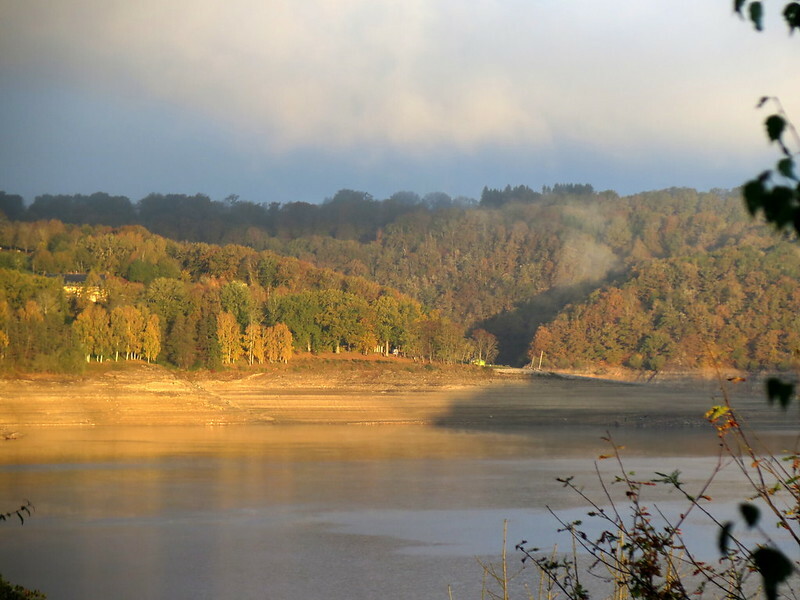 A reservoir in France; you can see where the water line once was. “Water, water everywhere, and not enough to drink”. 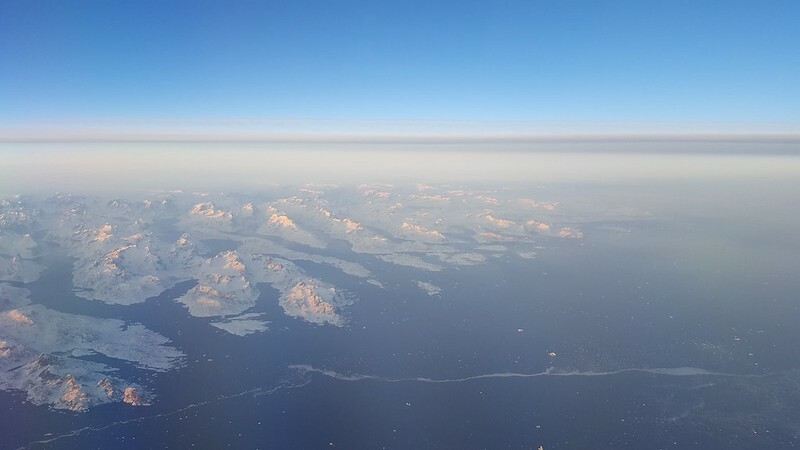 We may live on a blue planet, but nearly everywhere we went there seemed to be less water than ever before. Locals in Cartagena and Medellin noted it was a dry year, while friends in Australia spoke of drought and described this year’s wildfires in New South Wales. 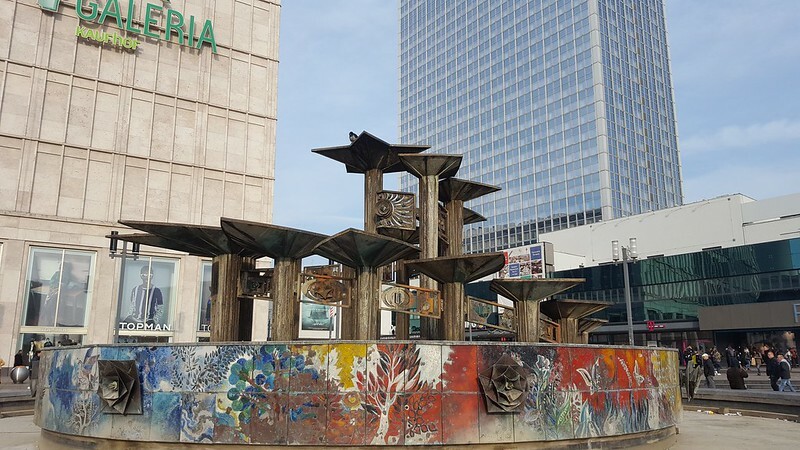 The trees in many cities and towns in Bulgaria showed signs of water stress, with curled brown leaves and wilted young branches. 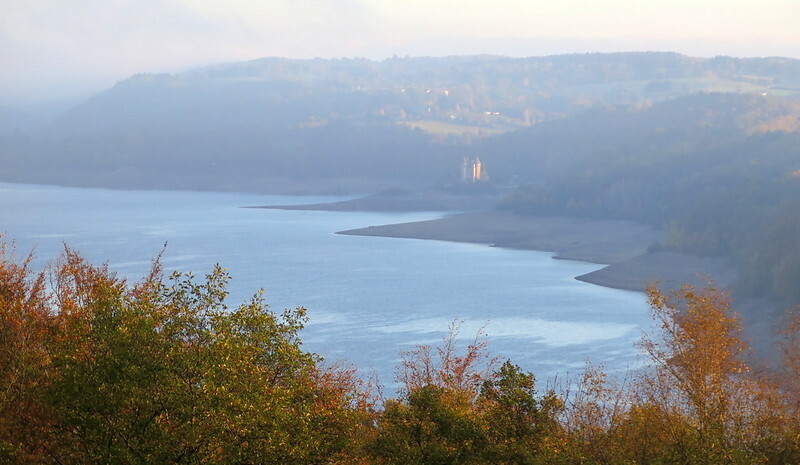 And driving through France, it was hard to miss the chalky white marks along reservoir edges marking old water lines, now feet above the current water level. Much of the world is getting hotter, and drier. Markings of waterlines suggest there’s been a steady decline in water here. 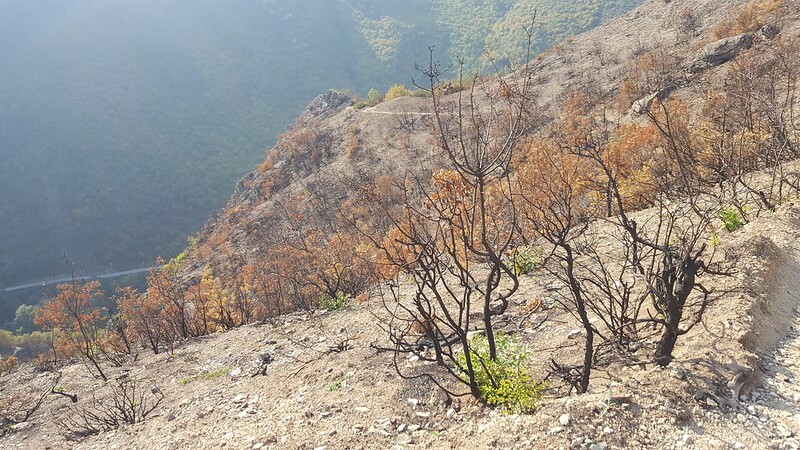 There remnants of a hillside brush fire in Macedonia. And where there is water, it is often polluted or perceived as polluted. Of the 28 countries we visited, we had to drink bottled or filtered water in more than half of them. We purified our water in Mexico, Central and South America, all of Asia, and parts of Eastern Europe because we were advised not to drink the tap water. Even in places where we were told the tap water was fine to drink in Chile and parts of Russia and Central Europe, we would often find locals drinking bottled water. Even if the water is drinkable now, in many places people don’t trust it because it wasn’t drinkable before. That’s a hard mindset to change, especially when people don’t see it as a problem to solve but an inevitability. 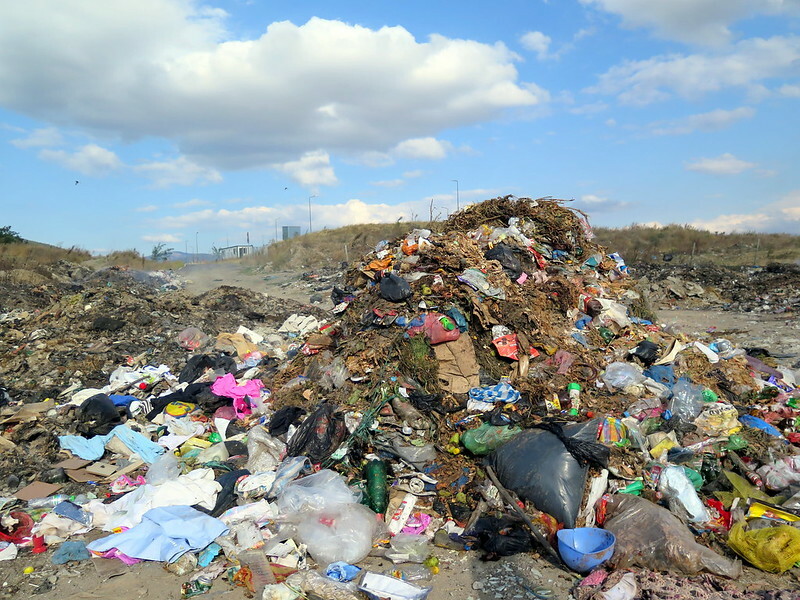 …but guess where those water bottles end up? Three: It isn’t just the poor vs the rich, it’s rural vs urban. 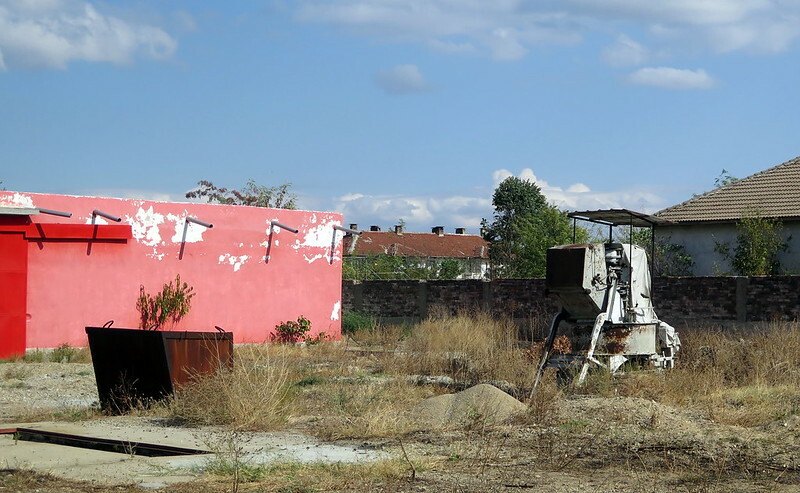 An abandoned machine in the town of Nikolaevo, Bulgaria. The wealth disparity in the world is another thing that’s hard to miss when you’re traveling, regardless of what country you’re in. The paradigm of the poor versus the rich is an ancient one and continues to this day. But now there’s a twist: it’s not just poor versus the rich, but it’s the rural versus the urban population. Nearly everywhere we went, the poorest people in the cities still had far more opportunities and resources than the poorest people in rural areas. Those who can travel to cities to work and sell goods, packing buses, trains, and roads. 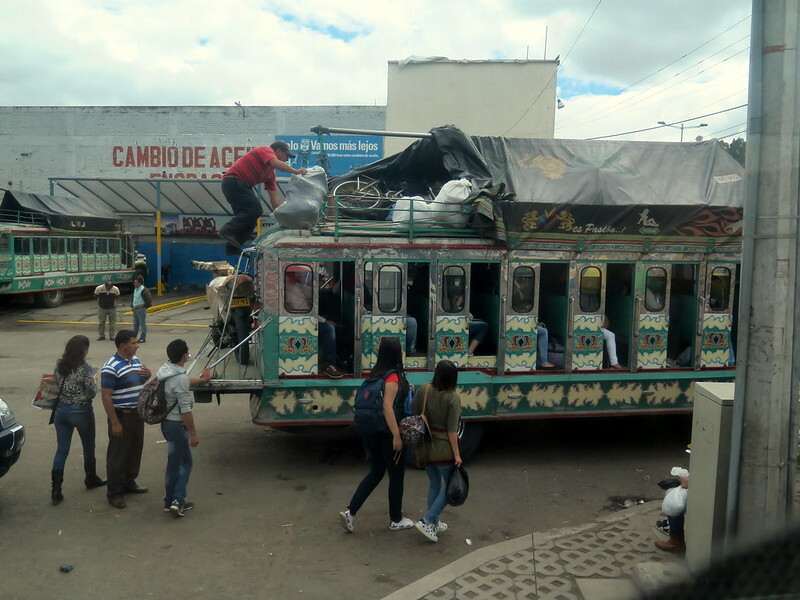 People board a bus bound for the city in Ecuador. This divide in wealth makes sense, because historically anywhere a concentration of goods and information arose a city would follow, and in turn a city would seek to increase the amount of goods and information at its disposal. But now there’s a new twist: information flows more freely than ever before out of cities into rural areas. 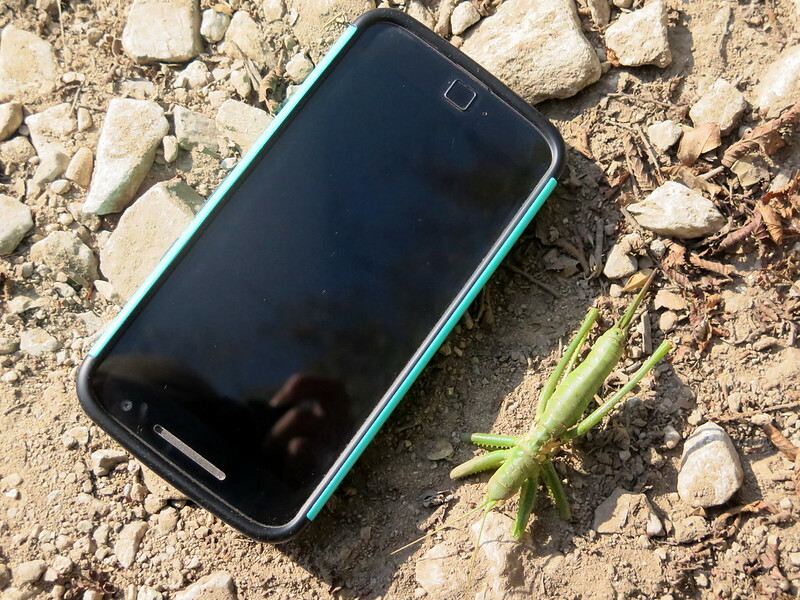 4G phone speeds may not be accessible everywhere, but you can surf the web in towns along the Baikal shore in Siberia and get cell signal in the Andes. Rural people (and everyone, really) have faster access to more information than ever before — including clear representations of life in the city, with all of those resources, with all of that wealth. 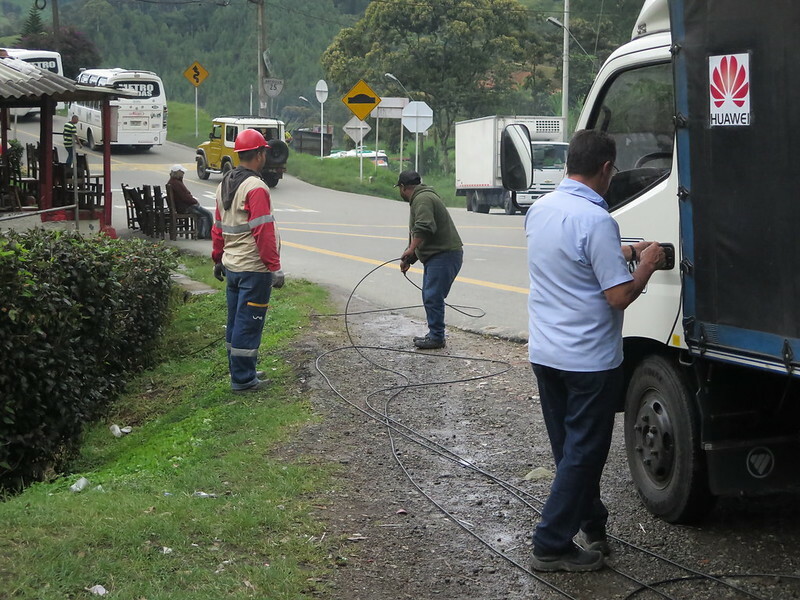 Men laying fiber optic cable in a more rural area in Colombia. They know what they’re missing out on, and that can’t feel good. The next challenge for us in tackling wealth disparity will be to build technology that facilitates the flow of goods more easily to rural areas. Otherwise we could have a lot of angry people on our hands. It’s still only mid-November, but that hasn’t stopped the Berliners from starting Christmas early. 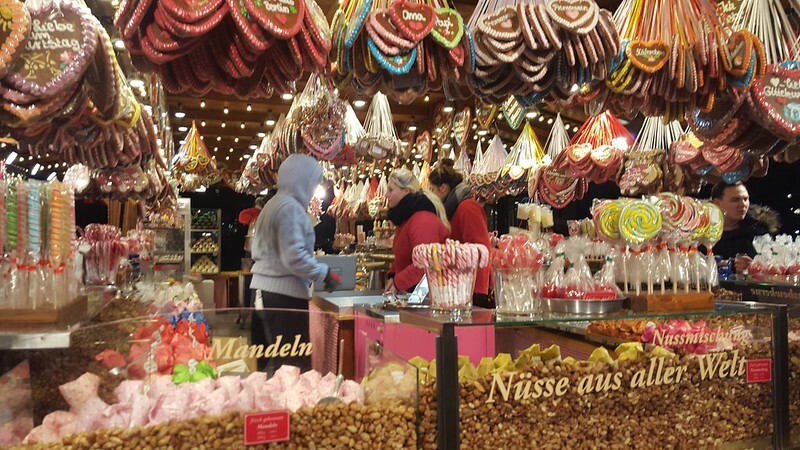 And it goes further than just the heaps of stollen, gingerbread, and spiced liquors in the supermarket nearby — they’ve opened a whole Christmas market at Potsdamer Platz. I’m flying out tomorrow, so Cindy, Eric, Anna, and I head out for one last adventure. Wow, did I mention this place was holiday-themed yet? The little wooden stalls are decked out in lights and doling out delicious winter carnival treats. 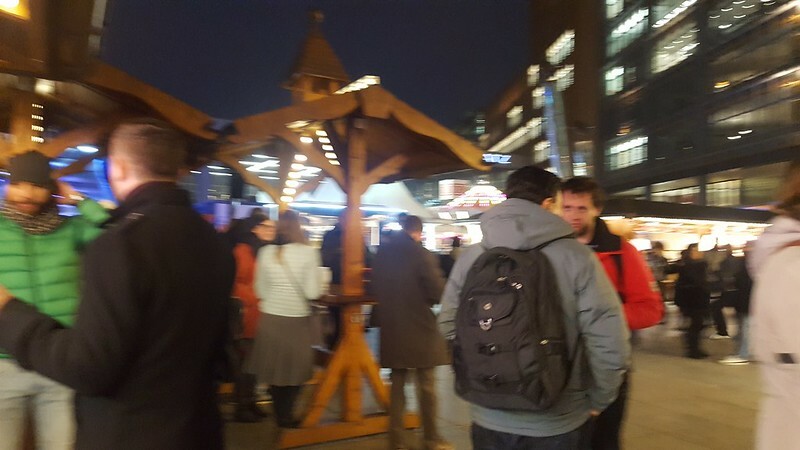 There’s one doling out hot drinks, including mulled wine and spiked hot chocolates, one selling out decorated cookies, candy, and spiced nuts, and multiple selling the fried food from various cuisines. 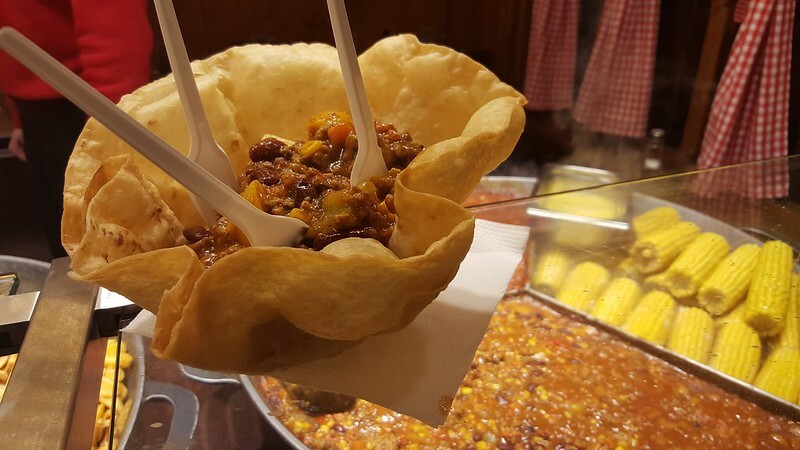 And then there’s…chili!?! 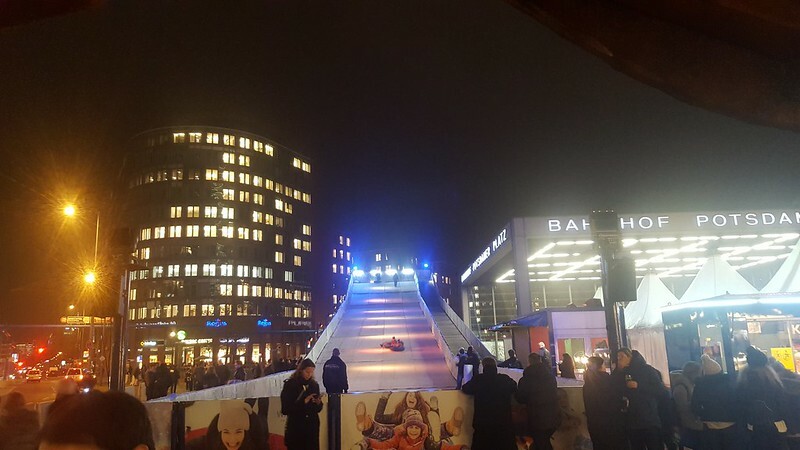 We wander around, eating as much as possible and watching people sled down an artificial toboggan hill. We wonder aloud when we might see each other again, with Cindy and Eric bound for Amsterdam for another workshop, Anna heading home to California soon, and me flying to Boston tomorrow. I want to keep traveling, but there’s also a pull to stay in one place for a bit where I can accomplish something. That feeling comes from my lab days, as a graduate student. You can’t run PCRs and cell culture when you’re on the road — at least, not yet. But a suitcase lab and interesting questions to chase would be all I need to pack up again*. I’ll miss the three of them, but it’s only temporary. With friends like these, we’ll be sure to see each other again. *Ironically, I will not be going back to the lab when I return. I have a new career waiting for me in consulting! We’ll see how it goes. 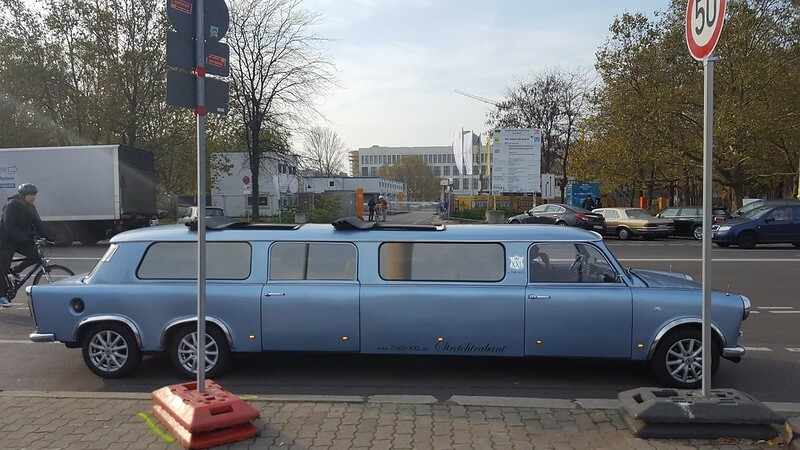 A parked Trabi limousine we saw on our tour. Two of my cousins that I haven’t seen in years, Sarah and Daniel, have flown in from England to meet me in Berlin! Their sister Mary would probably be happy to join, but she just wrapped up celebrating her birthday and got engaged so she has work and wedding planning. (Is it just me, or suddenly is everyone you know getting married too?) 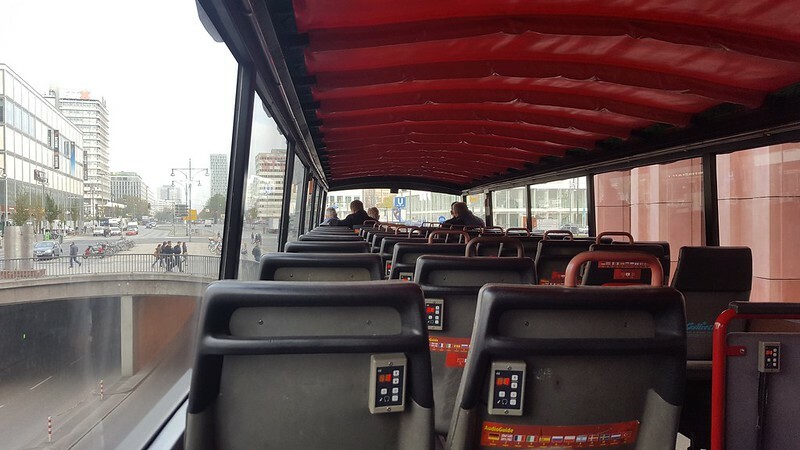 We buy tickets for a hop-on hop-off sightseeing bus around the city and spend the day as tourists. 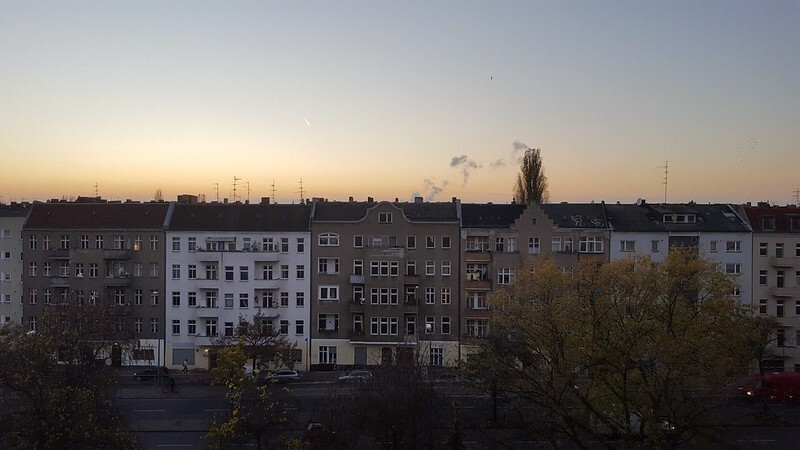 It’s probably good for me, since I haven’t actually seen much of Berlin beyond our Airbnb, some flea markets, and a nearby grocery store. We catch one of the buses and spend the day exploring, listening to the bus’s pre-recorded tour information and disembarking when we please. So it’s not a glorious royal coach. But it’ll do! 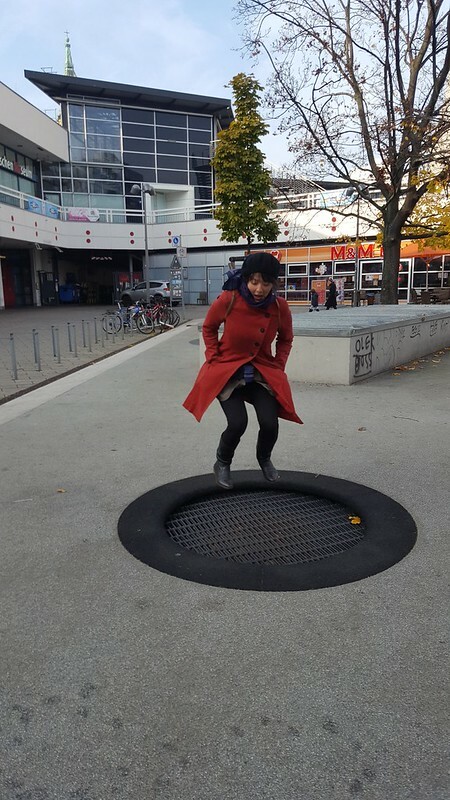 There are trampolines with awesome bounce built into the sidewalk near Potsdamer Platz! 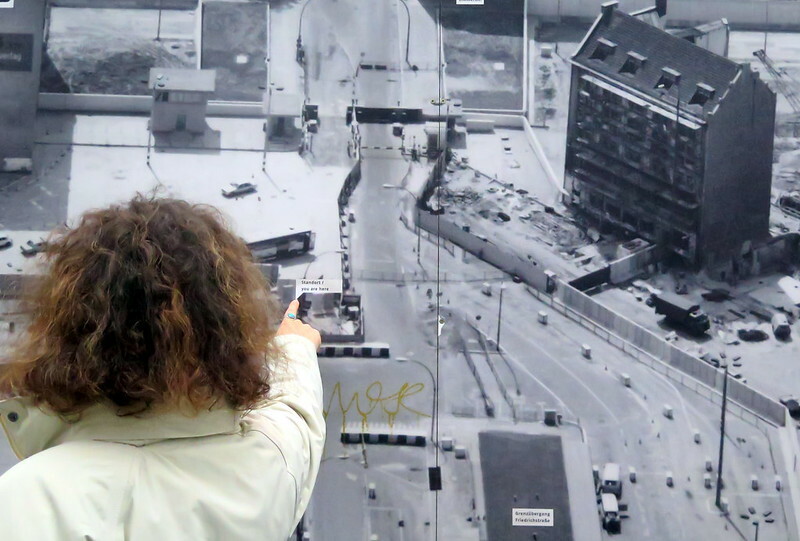 Another tourist figures out where we are on an old aerial photograph of the Berlin Wall. 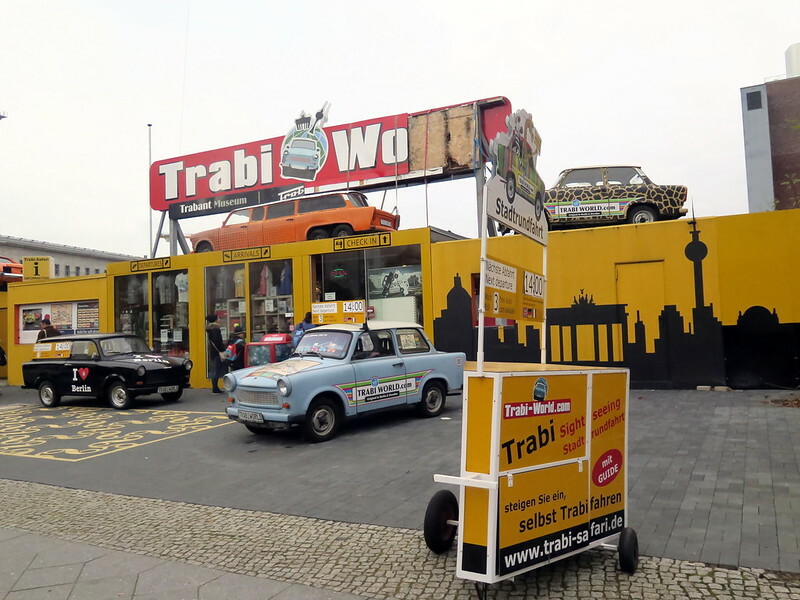 Trabi world, where you can get all of your Trabant-related merchandise. For those who don’t know what a Trabant is, it’s a “famous” East German car brand. At the end of the day we say goodbye over glasses of wine. 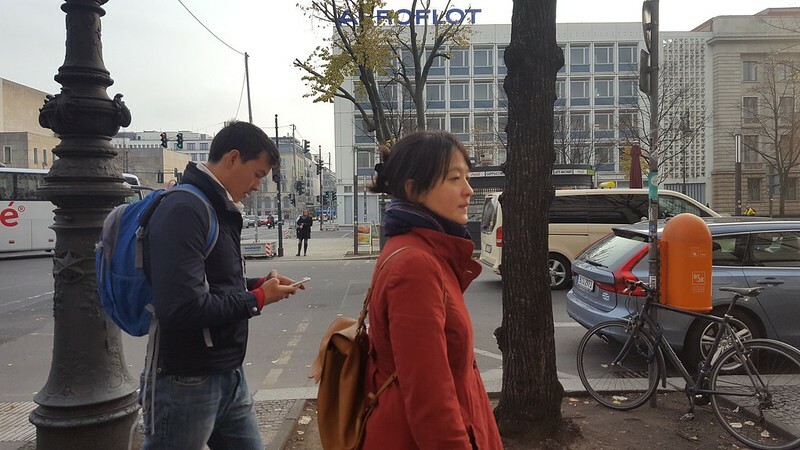 Sarah and Daniel will return home tomorrow, after less than 48 hours in Berlin. I’m so lucky they came to visit, since I won’t get a chance to visit them in England before heading back. Speaking of, there is less than 72 hours before I board a plane as well, bound back to the U.S.